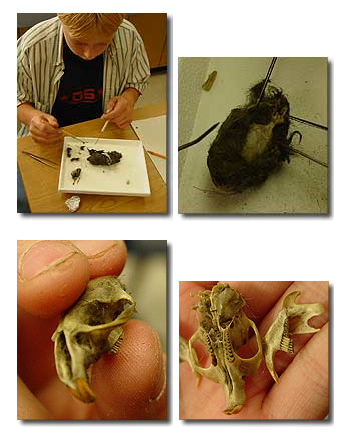 Teaching Idea – Owl Pellet Dissection – ScienceMan! As long as you are using owl pellets from biological supply companies, this activity is perfectly safe – the owl pellets are fumigated so as to eliminate any chance of disease. The pellets are relatively cheap, and up to 3 students can share a pellet, so it’s not only fun, but it’s affordable as well. Owl pellets from scientific supply companies can have variable contents depending on what the owls are fed. It’s actually kind of difficult finding reliable bone guides on the web, but you might start with this one from Carolina supply – Owl Pellet Interactive Database. The following pictures are from a ScienceMan grade 7 class… they might just help you identify bones (hopefully we got them all right!) 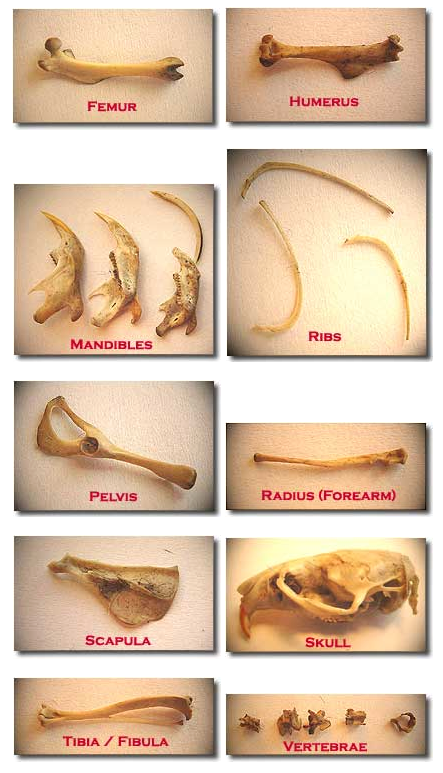 We’re pretty sure the bones were from the most common of the Owl’s “victims” the pocket gopher. Kidwings Owl Pellet Dissections – A good virtual dissection – NEW AND IMPROVED! The site provides a very impressive and fun Flash-based virtual dissection. OwlPages – Wow! This page is a hoot! (Sorry, I couldn’t resist) An amazing amount of owl information.